We sometimes take for granted that we can carry an entire music studio around with us in our pocket. It is so easy to forget the days of hauling around the Rhodes suitcase and “real” CP-70s, small video monitors (the ones with the large and heavy tubes protruding out of them). If you were lucky your computer had a whopping 1 megabyte of memory and who can forget the floppy disk? Now fast forward to the present day. Most of us have at least one tablet or smartphone device that packs more computing power than all of the computers used to launch the first Apollo moon missions. So a keyboard in your pocket is not a far fetched idea as most of us are carrying one around with us now. The problem is that there is only so much you can do with a touch screen based device, sometimes you need a little bit more. With the introduction of the iRig Keys mini IK Multimedia continues to expand upon their series of portable keyboard controllers. Here they balance a small form factor with true keyboard performance. There have been other small USB keyboard devices that did not quite feel like you were playing a keyboard, on the contrary sometimes it felt like you were just playing a glorified typewriter. When you first break open the box you have the iRig Keys mini, a getting started guide and a registration card where you will also find information on the free companion apps to get started with right away. A QR code and link are also provided for you to download the complete users guide. Also included are three communication cables to connect to your device of choice. This is great as you can use the iRig Keys mini with a wide array of devices ranging from desktop PCs to phones and tablets which really expands on the versatility of this product. 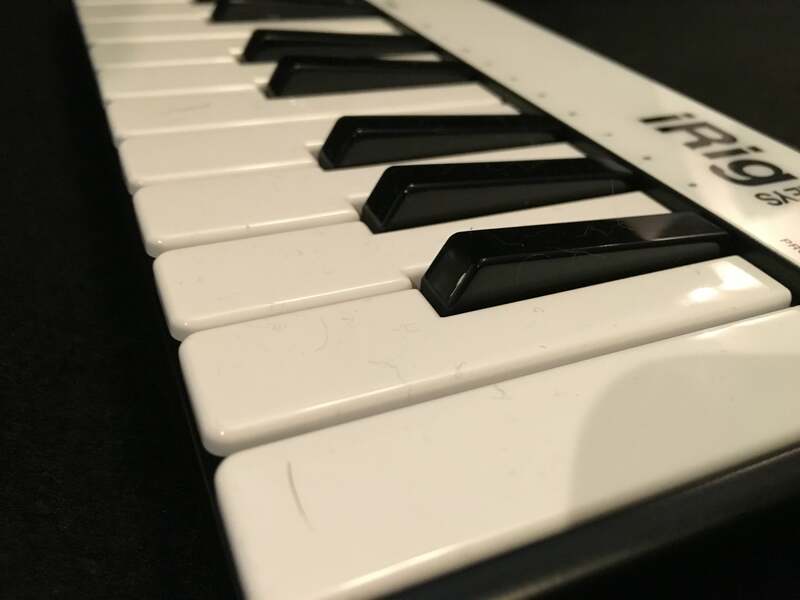 The iRig Keys Mini provides a set of 25 keys that have a nice depth or travel to them. You can dig into the keys a little without bottoming out too soon. I noticed the black keys have a slight angle to them which I found interesting. This allows you to play the keys with more confidence as you are more on target with the the notes, not just hoping you will play the right one. This is definitely an improvement over the flatter keyboard arrangements as you cannot voice chords as easily as you can with the iRig Keys Mini. The keys felt really good under my fingers. Many times a smaller keyboard controller can just feel downright spongy. The iRig Keys Mini on the other hand while not like a full sized weighted 88 key controller did feel surprisingly firm and drew me in to experiment with the possibilities of playing a smaller keyboard. One of the challenges with a portable keyboard is running out of notes. This is especially true when you are so used to playing larger scale keyboards. 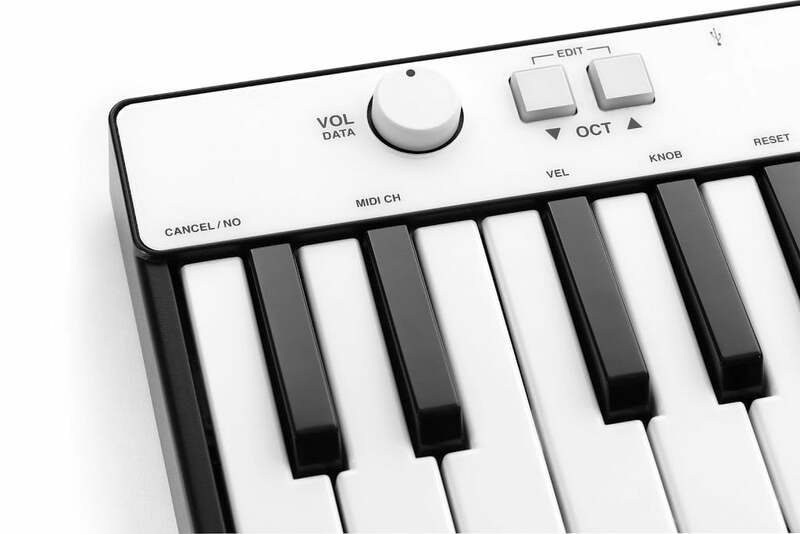 The iRig Keys mini addresses this by providing an OCTAVE Plus and Minus control. This is placed in a convenient location just along the top of the keyboard. With some practice and a little finger magic you can hop between octaves without too much incident ( I can picture Jordan Rudess mastering this). There are many other parameters that can be adjusted from the iRig Keys mini such as velocity curve, midi transmit channel, etc. these are accessible through a clever use of the EDIT MODE and using the keys themselves as selectors partnered with a data entry control knob again placed along the top portion over the keyboard. The iRig Keys mini is meant to connect to whatever device you might haven. On the rear panel you will find a micro USB connector to communicate with your device of choice. IK Multimedia has generously included three separate USB connectors for that purpose. You have a micro USB to Lightning connector so you can go straight into your iPhone or iPad. This eliminates the need for the separate camera connection kit in order for you to connect outboard USB devices. 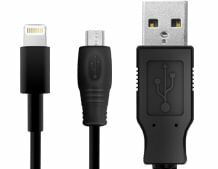 You also have a micro USB to standard USB Type A connector in order for you to connect to your Mac or Windows PC. I connected the iRig Keys mini to my Windows 10 PC running Cakewalk SONAR Platinum and it was immediately recognized and showed up under my available MIDI input devices. Lastly you have a micro USB to micro USB in order for you to connect you iRig Keys mini to your Android devices. I was not able to test this but it seems that IK Multimedia is making sure all possibilities are being covered. They even offer a micro USB to the Apple 30 Pin connector for older iOS devices on request. Set the MIDI Transmit Channel. Set different touch (velocity) sensitivities. There are five settings available ranging from several fixed velocities to some standard velocity curve profiles. Assign a specific MIDI Control Change number to the VOL/DATA knob. 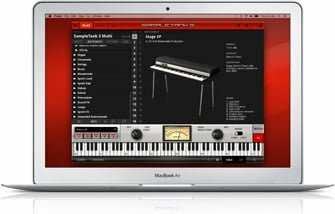 Send specific MIDI Program Change numbers and set the current program number. The Edit mode is activated by pressing the Octave up/down buttons simultaneously. The keyboard is labeled with the various parameters that are available as well as other function keys to assist with data entry duties. This is a great way to work with the iRig Keys mini as it helps to save cost on multi character displays and additional data entry hardware. If you are new to producing music on a tablet or phone IK multimedia will get you started. They accomplish this by providing downloads for some of their music production apps, notably SampleTank 3 and their iGrand instruments. You are also given 25 Gear Credits to use in the IK Multimedia Custom Shop. This is where you can download new sounds and effects from their vast library. 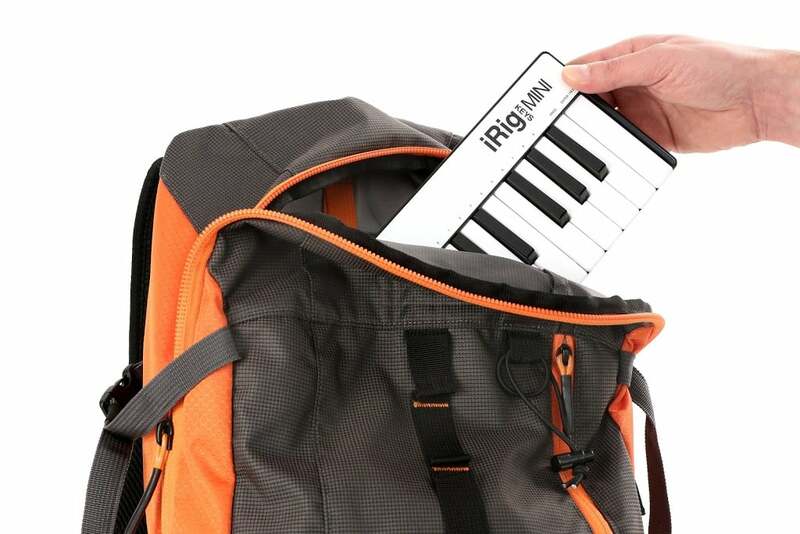 The iRig Keys Mini would be a good choice if you had to carry a small controller with you while traveling. It would fit nicely in a backpack or messenger bag along with your laptop or tablet. Since the iRig Keys Mini is powered through the USB bus there is no need for an external power supply which is a big bonus as it eliminates one more adapter you would otherwise need to carry. All in all the iRig Keys mini has many attributes of a larger keyboard. The form factor is a nice balance of weight and thickness that does not sacrifice play-ability. The detailed use of the USB spec allows you to have great flexibility and portability not limiting you to just a certain class of mobile and desktop devices. I have not been too big of a fan when it comes to smaller keyboards as I really enjoy the freedom to stretch out over the length of the 61 and 88 note varieties. I have to say though that the iRig Keys mini is winning me over and is fun to play. 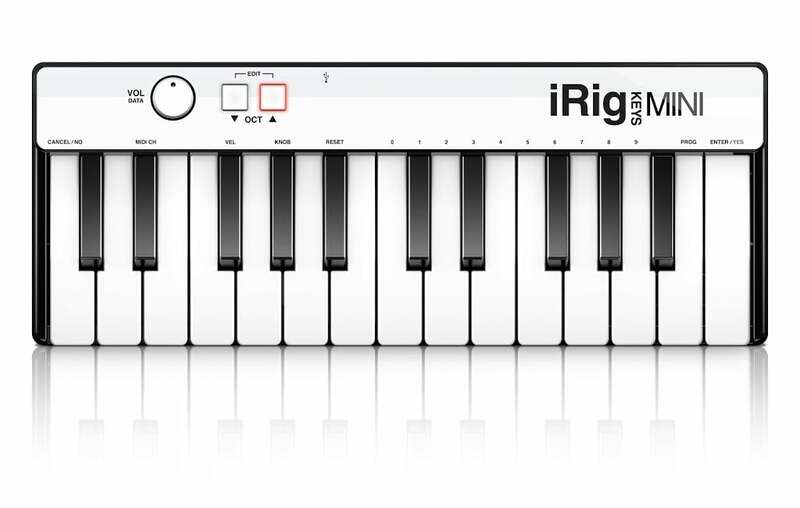 The iRig Keys Mini is available now. For more information visit IK Multimedia’s website. Also you can watch my complete hands on review below.